We welcome foodservice customers to visit our Products page for a comprehensive list of Harris Ranch Beef programs. We hand select beef to ensure our foodservice customers receive a product they can feature on their menu with pride. Harris Ranch—a name, a destination and a brand known throughout the West for quality beef—is consistently recognized as the most progressive, innovative and quality-conscious beef producer on the West Coast. Consumers look to the Harris Ranch brand for beef that’s always tender and great tasting. The same grass-raised and grain-finished beef that generations of travelers have enjoyed at the Harris Ranch Restaurant in California is available nationwide for foodservice operators seeking a superior center-of-the-plate offering. Harris Ranch remains a preferred brand of beef due to how we raise our beef, as well as our exemplary animal welfare and food safety practices. What makes Black Angus Beef a preferred center-of-the-plate offering? Through our Partnership for Quality (PQ) program, Harris Ranch is able to source an increasing number of young feeder cattle of known Angus genetics that meet specific criteria for cattle performance and carcass quality. We are also able to source Angus cattle from other producers with whom we have long-standing relationships—producers committed to the same core values as Harris Ranch. The United States Department of Agriculture (USDA) provides oversight to the Harris Ranch Black Angus Beef program. Strict requirements for carcass traits must be met. Following USDA inspection and grading, Harris Ranch’s Quality Assurance staff selects only the highest quality beef based upon stringent standards that have made the Harris Ranch name synonymous with superior quality. Our strict attention to detail and hand-selection results in the most consistent, highest quality, products for our foodservice customers. 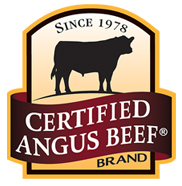 Only truly exceptional Black Angus beef earns the distinctive Certified Angus Beef® label. In fact, only one in four animals meet the carcass specifications needed to qualify for this exclusive Harris Ranch brand. Set apart from the best of the USDA Choice and Prime grades, Certified Angus Beef® is incredibly flavorful, tender and juicy. To earn this elite label, cattle must be Angus-influenced with a predominantly (51% or greater) black hair coat, and the beef must pass 10 science-based specifications for quality.